As you plan for a healthier 2016, why not add this sight-saving exercise to your list of resolutions: Get a comprehensive dilated eye exam. It’s the only way to find out for sure whether you have glaucoma, one of the leading causes of blindness in America. An eye disease that can rob you of your vision, glaucoma often comes with no early warning. No pain. No discomfort. No blurry vision. Nearly 3 million people have glaucoma, yet half don’t know they have it. You can take action to protect yourself from glaucoma. Everyone at higher risk should get a comprehensive dilated eye exam, which is different from the basic eye exam for glasses. A comprehensive dilated eye exam is a procedure in which an eye care professional places drops in your eyes to widen the pupil and looks at the optic nerve for signs of the disease. 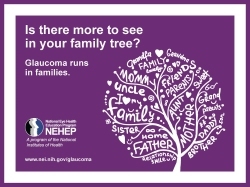 To learn more about glaucoma, view this animated video. 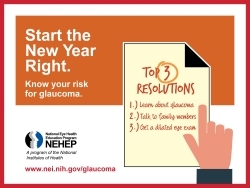 For tips on finding an eye care professional and for information on financial assistance, visit www.nei.nih.gov/glaucoma or call NEI at 301–496–5248. For more information, visit www.nei.nih.gov.